Alabama, Arkansas, Illinois, Missouri, Tennessee and Washington, D.C.
By 2050, the global population is projected to be nine billion, resulting in a near-doubling of global food and fiber demand. Doubling food and fiber production and sustaining the production at that level are major challenges, but doing so in ways that do not compromise environmental integrity and public health present even greater challenges. Intensification of agriculture through the use of high-yielding crop varieties, fertilization, irrigation and crop protection remain the most likely options to combat these challenges. In the past, the emphasis was on improving potential yield; but today, there is increased emphasis on improving the nutritional value of foods (e.g., protein content in grain, essential amino acids, content of other minerals, etc. ), reducing post-harvest losses, improving stress tolerance and/or reducing reliance on chemical crop protection products (CPPs). Recently, there have been enormous advances in agricultural production, not only improving productivity, but just as importantly, safeguarding the environment. Several systems-research tools relating to information technology have become available for fertilizer management. With the introduction of geographic information systems (GIS), global positioning systems (GPS) and remote sensing (RS), farmers can now refine nutrient recommendation and water management models to the site-specific conditions of each field. Substantial variations in soil properties and nutrient and water availability exist across most fields. Thus, the ability to apply site-specific nutrient and irrigation management to match spatially and temporally variable conditions can increase application efficiencies, reduce environmental impacts, while improving yields. Precision farming technologies have now been developed to spatially vary nutrients and water prescriptions within a field based on various information sources (soil properties maps, terrain attributes, remote sensing, yield maps, etc.). Precision agriculture involves the integration of the new technologies (including GIS, GPS and RS) to allow farm producers to manage within field variability to maximize the benefit-cost ratio. Variable rate technology (VRT) available with farm implements, such as fertilizer or CPP applicators and yield monitors, has evolved rapidly and has fostered the growth of precision agriculture. For example, in the Midwestern United States, chlorophyll meters, a recent development in agriculture, are used for corrective nitrogen (N) management where N fertilizers are applied based only on crop needs to ensure increases in fertilizer use efficiency and return on fertilizer investment. In-season prediction of crop yield potential using models is becoming available for cereals. This technique offers possibilities for real-time nutrient and water management in prescriptive and/or corrective concepts. The models are based on a quantitative understanding of underlying processes and integrate the effects of soil, weather, crop, pests and management factors on growth and yield. According to the Food and Agriculture Organization (FAO) of the United Nations, nearly 40 percent of the world’s food is produced by irrigated agriculture, which covers about 250 million hectares (corresponding to 17 percent of total arable land) and is the major user of fresh water, accounting for 70 percent (on average, and up to 90 percent in many countries) of worldwide water taken up for human use. Since high-quality irrigation water is becoming increasingly scarce, it is becoming more important to use available water efficiently. One approach being adopted to overcome this constraint is the use of soil moisture sensors to control irrigation. Soil moisture sensors can detect when the substrate water content drops below a grower-defined set point and can be used to automatically turn on the irrigation when needed. 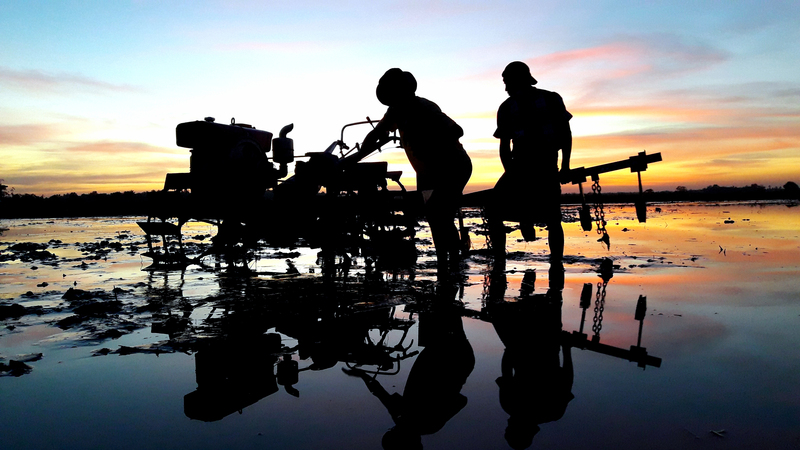 These emerging technologies are ushering in a new era that will affect farmers’ day-to-day operations and improve their ability to compete in the global market. These innovations will also contribute to increased agricultural productivity and transformation of agribusiness infrastructure. Many of these advanced technologies, as well as the concepts and approaches in strategic farming in the U.S., are directly applicable to agricultural production in developing and developed country environments. Therefore, the study tour will provide participants with a unique opportunity to develop their professional skills and at the same time build collaborations. IFDC is uniquely positioned to stay abreast of the latest technologies related to soil fertility and water management and how they can be applied to developing and developed country agriculture. IFDC has well-established relationships with essentially all public and private sector organizations that impact agricultural production in the U.S. This study tour will allow participants to visit some of these organizations including, but not limited to: farmer cooperatives; the U.S. Department of Agriculture; Monsanto; The Fertilizer Institute; research and education centers of major agricultural colleges and universities; and many large- and small-scale farmers. Interactions with these entities will provide the participants with an opportunity to see how farmers, agribusinesses and policymakers are adjusting to today’s agriculture challenges in ways that ensure agriculture in the United States remains competitive on a global scale. While in the Midwestern U.S., participants will be offered the unique opportunity to visit the Farm Progress Show, which is the largest outdoor farm show in U.S. agriculture and features the most extensive state-of-the-art farm equipment and information and technology available for today’s agricultural producers. This workshop is designed for innovative farmers, agronomists, soil scientists, researchers and extensionists from national and international agricultural research institutes and universities, as well as policymakers from governments and ministries in charge of agricultural productivity and planning. Executives and managers of fertilizer and agricultural input organizations will find this program extremely interesting. Government officials involved in developing strategies for increased agricultural production through the use of emerging technologies that promote resource conservation and increased efficiencies should also benefit from the program. Participants should be fluent in English. Improve participants’ knowledge and understanding of recent technological advances in the areas of biotechnology, sensor-based irrigation, information management, precision agriculture and remote sensing technologies. Familiarize the participants with the farm-level impact of each of these advances on water and nutrient management under changing climatic conditions. Provide an opportunity for participants from many countries and backgrounds to observe and discuss the practicality and economics of integrating these innovations into the mainstream of major crops. Expose participants to trends and challenges in the agricultural global market and show how farmers, agribusinesses and policymakers are adjusting to them by using state-of-the-art information and technology available for today’s agriculture production. Overview of U.S. agricultural production and fertilization. Economic benefits of integrating agricultural technology advances in U.S. agriculture. Fertilizer and nutrient use efficiency in agricultural production. Nutrient management using precision agriculture and remote sensing technologies. Overview of advances in water management in agricultural production, e.g., sensor-based irrigation management. Precision agriculture involving nutrient and water spatial and temporal variability management. Precision agricultural systems farm-level impacts (real and/or potential) from national policies and international agreements on trade and the environment (e.g., biofuel production and its impacts on commodity prices, reserve stocks and national fiscal, environmental and energy policies). Information management and agricultural extension services: Smart phone applications and advisory services (crop management, fertilizer use, irrigation schedules, weather and pest control). Strategic planning and risk management in times of uncertainty. Biotechnology and advances for crop improvement. Managing natural resources and environment under changing climatic conditions. Advances in sustainable, environmentally-safe use of CPPs and bio-engineered agriculture. U.S. Government policies and regulations on fertilizer and crop protection. International faculty from IFDC, leading U.S. agricultural producers and other international experts. Diverse and participatory activities based on training activities, key lectures and films. Written training materials for permanent reference. Eight-and-a-half (8½) days of field visits to observe recent advances in irrigation and nutrient management, biotechnology, precision agriculture, etc., and one-and-a-half (1½) days of classroom-style presentations and discussion opportunities. The discussions and interactions will generate considerable information which will help prepare participants to improve their abilities to compete in the global market and assist farmers in their day-to-day operations. The program will begin Monday morning, August 21, 2017, at IFDC headquarters in Muscle Shoals, Alabama. Thus, participants are expected to arrive on Sunday, August 20, 2017. After two days in Alabama, participants will travel as a group via bus to Tennessee, Arkansas and finally to St Louis, Missouri. Participants will travel as a group via plane from St. Louis to Washington, D.C., where the program will conclude on Friday, September 1, at approximately 5:00 p.m. While the training will officially end Friday evening, an optional half-day bus tour of Washington, D.C., will take place on Saturday, September 2, provided that we have enough participation. Participants should return to their home country from Washington, D.C. It is up to the participants to select their departure date, bearing in mind that the negotiated room rate in D.C. may not be available for extended stays past September 2. Further details about flight booking and lodging will be provided later. For detailed information about the hotels selected, please refer to the program brochure from page 9 to 12. The food and lodging expenses will average approximately US $130/day in Alabama, Arkansas and Tennessee; approximately US $140/day in Missouri; and approximately US $200/day in Washington, D.C. Participants should plan to arrive no later than Sunday, August 20. Huntsville is the nearest city with an international airport and is located approximately 75 minutes from Muscle Shoals/Florence area. An IFDC staff member will meet participants at airport and provide transport to the selected hotel. The selected hotel is located in Florence, Alabama, which is just seven miles away from IFDC headquarters, where the training will take place while in Alabama. To ease in logistics and stay together as a group, all participants should book a flight for Wednesday, August 30, on American Airlines Flight # 4418 departing St. Louis at 1:15 (13:15) p.m. and arriving in Washington, D.C. at 4:24 (16:24) p.m. Participants should return to their home country from Washington, D.C. While the training will officially end Friday evening, September 1, at approximately 5:00 (17:00) p.m., an optional half-day bus tour of Washington, D.C., will take place on Saturday, September 2, provided that we have enough participation. It is up to the participants to select their departure date, bearing in mind that the negotiated room rate in D.C. may not be available for extended stays past September 1. Participants planning to extend their stay are kindly requested to contact the hotel in advance to get the applicable room rate to their additional days. Note: Participants are advised to book tickets as early as possible as the above-mentioned plane could become full and prices will continue to increase until departure date. APPLICATIONS FOR NECESSARY VISAS SHOULD BE MADE AS EARLY AS POSSIBLE. A visa is required for entry into the United States. Each participant must obtain a visa from the Embassy or Consulate of the United States in their country of residence. Participants should fulfill all required immunizations and health formalities before departing their country of residence. Medical insurance should be obtained by participants. The program fee does not cover any medical insurance or expenses. The program fee for this training course is US $2,500 per participant (inclusive of a US $250 non-refundable deposit) and should reach IFDC no later than July 21, 2017, four (4) weeks before the program is scheduled. Those received thereafter will be accepted at IFDC’s discretion and incur a late fee. Participants will be given the opportunity to take advantage of an early bird rate if registration and payment is received by IFDC prior to June 21, 2017. Please refer to the table for pricing. The program fee covers registration, training and reference material, coffee/tea breaks, all lunches and surface transportation on field trips. The fee does not include air travel, lodging and dinner expenses, or medical and communication expenses. The program fee covers registration, training and reference material (including IFDC/UNIDO Fertilizer Manual), coffee/tea breaks, all lunches and surface transportation on field trips. The fee does not include air travel, lodging and dinner expenses or medical and communication expenses.